The search interface on the website is very nice, allowing users to refine a search by time period, by genre (podcast, video, article, etc.) or by broad topic area. In the app version (podcasts only), it appears that one can browse by broad topic area, but cannot search on keywords. Because the content is intended for non-specialists, these brief pieces provide a great model of vocabulary and turns of phrase that allow us to explain technical content to friends, family, potential funders, policy-makers, administrators, managers, and students. Articulation is crisp and clear, which makes for easier listening comprehension than one might find in less polished audio. In the free app version (for podcasts only) and when you click on the title of a podcast on the website version, you’ll see a transcript, allowing you to grab phrases that might be hard to catch when just listening alone, and making it possible to speak along with the original to practice clear articulation and smooth delivery. To work on vocabulary, you might want to note down words or turns of phrase that seem useful in any one of the podcasts, and then maintain and practice them in a vocabulary.com wordlist (free account needed) or by using a free phone app like gFlash+ that lets you easily set up flashcards with your own content on your smart phone–even flashcards with more than two sides! This particular app (not related in any way to Scientific American) is available for Android, iPhone and iPad, Nooks, and at the Amazon.com App Store. 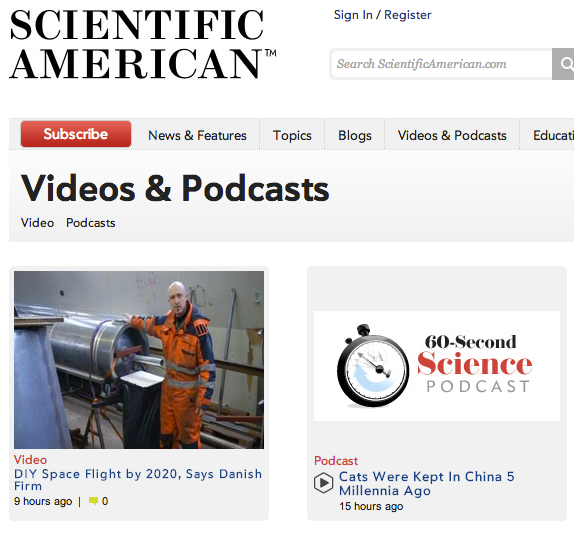 Another way to use the Scientific American site or podcast app to work on fluency is to search on a term of interest to you, listen to a couple of podcasts and read a short article, and then imagine what you’d say to tell someone in English about this content, synthesizing all three together. Practicing out loud even if you don’t have a real audience is helpful for fluency & solidifying new vocabulary. 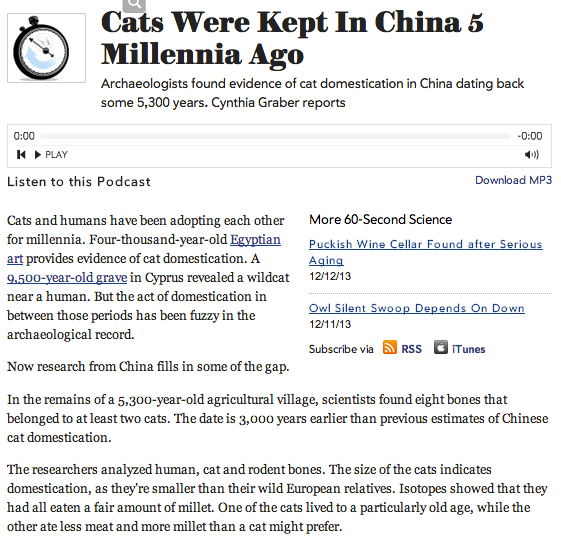 There is one disappointment among the Scientific American resources. I wish that audio podcasts would provide an accurate model of intonation one might use in a conversation or presentation when not reading from notes, but intonation is typical of material read aloud by a dynamic speaker. These intonation patterns are certainly appropriate for the solo audio podcast genre, just not very helpful for types of speaking when others are physically present. Nonetheless, if you feel like your intonation in English is somewhat “flat,” it may be useful to imitate the original speakers’ intonation in order to explore a wider pitch range, because the intonation in the podcasts is quite expressive among both male and female speakers. Categories: Amazon Apps, Android, iPad, iPhone, Nook, Suggested Apps, Suggested Websites | Tags: Android, Apple, fluency, intonation, listening, paraphrasing, pitch, pitch range, podcast, practice, reading, science, transcript, video, vocabulary | Permalink. Monash University in Australia hosts an academic English language self-study website, Language and Learning Online, with vast breadth and depth in reading, writing, speaking, listening, and grammar. 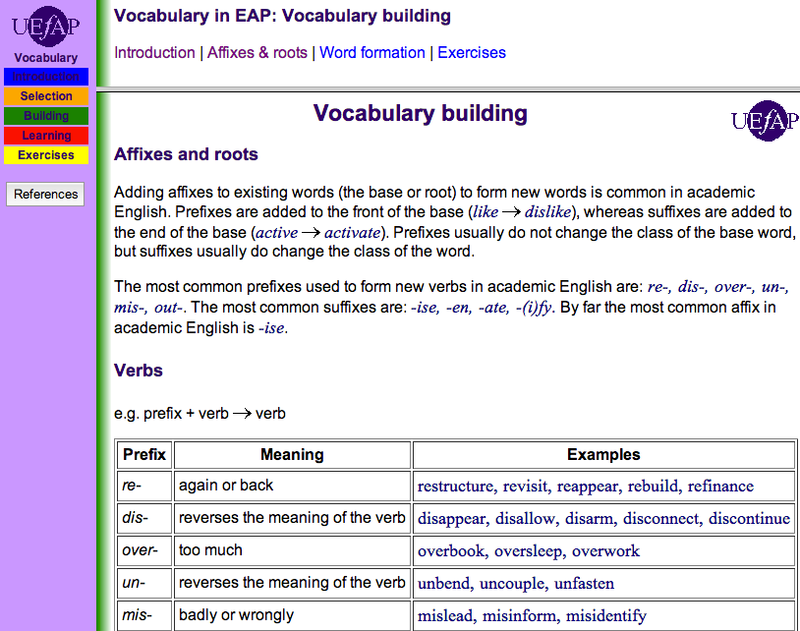 on the left frame of the page, you can find resources organized by academic discipline (e.g. Medicine or Sociology) and by level (e.g. undergraduate or PhD). 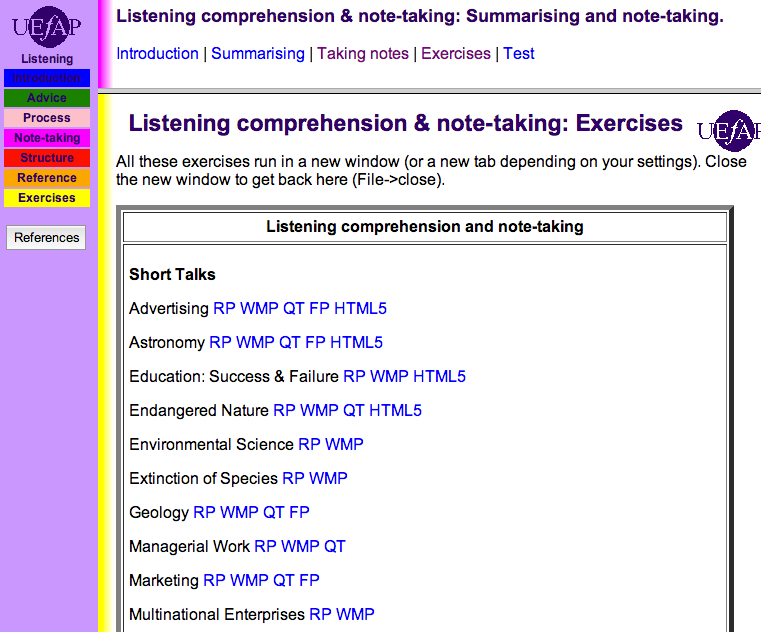 Searching the Resource Finder by exercise type today, I found 278 different interactive online exercises. The site provides an excellent overview of writing genres in a variety of academic subject areas. I particularly like the treatment of academic reading. 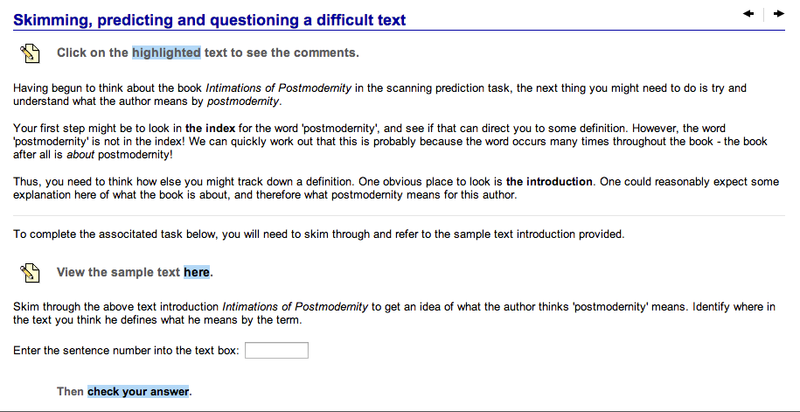 Here is an example exercise that gives the user an opportunity to practice locating the specific definition of important terminology in an academic book or paper. 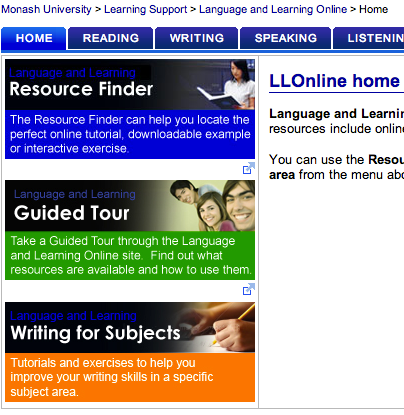 What section of the Monash site did you find useful. Reply with your comment here! Categories: Suggested Websites | Tags: academic, academic reading, Australia, college, disciplinary terminology, genre, grammar, interactive, listening, masters, Monash University, PhD, reading, speaking, undergraduate, university, writing | Permalink. L’Université de Franche-Comté in Besançon, France has a prominent “Applied Linguistics” program. Part of the way this program shares its expertise on language learning with the world is to host “English Online France” http://eolf.univ-fcomte.fr, a website with dozens of free interactive games, exercises, and tips for learning English independently. Most of the instructions and menus are in English, which enables advanced English learners from any language background to use the site. I especially like the movie trailer dictation exercises under “ESL/EFL Listening Exercises.” Movie trailers contain a lot of dialogue, place names, and slang. You can watch your selected trailer as much as you like, and you can type any word you hear–if you’re right, the word is completed in the text and you win a point. For these, a QuickTime plugin for your browser is needed, and it works much better in Firefox than in Chrome or Safari. If you test it in Explorer, you can leave a comment here telling us all how it worked. In the Reading section, there are some nice activities that model things you could recreate–mixing up the sentences in an abstract in an academic research article, and then putting them back together, as a means of internalizing the structure of research articles. There are a variety of fun “interactive reading” exercises, where you guess the next few words of a reading from among three choices, which rehearses prediction, grammar, and collocations (which words sound right together). Many of the pronunciation exercises are excellent. Influenced by the Silent Way method of teaching language, users are left to intuit rules from the patterns and tasks they observe and experience. The pronunciation tasks are well-designed to reveal patterns of stress, intonation, voicing, and more. 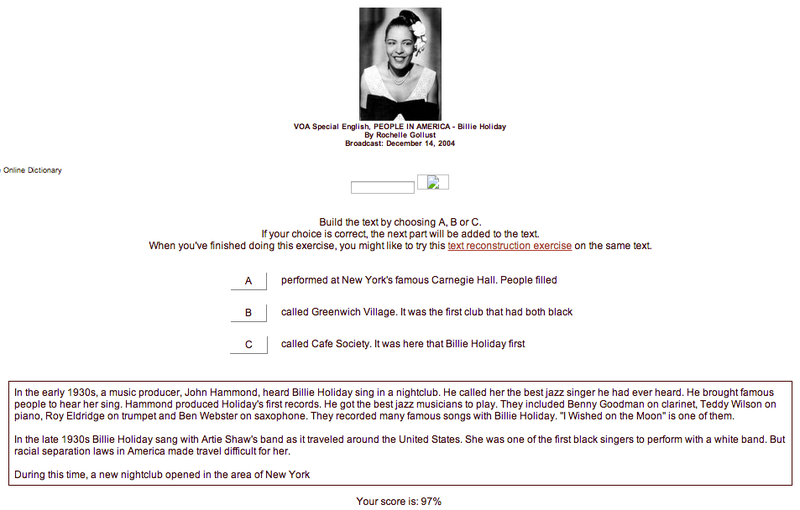 Most of the grammar exercises seem pretty easy (or are hard without explanation of the rationale behind answers), but some are both challenging and valuable practice, such as the “ESL/EFL Making Questions Exercises.” Note the asterisks (*) denoting level of difficulty, and go for two or three stars. What activities did you try on this site? Which ones do you recommend? Leave a comment with your advice. 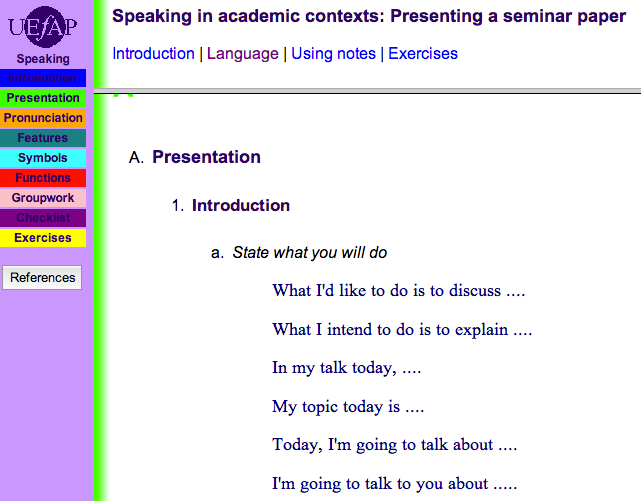 Categories: Suggested Websites | Tags: academic, Besançon, dictation, film, Firefox, games, grammar, interactive, listening, movies, pronunciation, QuickTime, speaking, trailers, vocabulary | Permalink. A little bit of lighthearted fun this week for listening to fast, fluent English and for expanding one’s casual, social vocabulary. 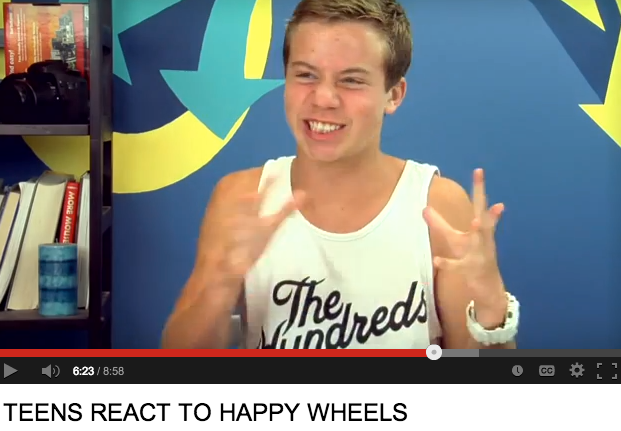 A prolific YouTube channel, Fine Brothers Productions, http://www.youtube.com/playlist?list=PL23C220A2C5EC0FDE, produces quite a bit of content reacting to other content–and the Teens React To X series is a great demonstration of everyday English, expression of opinions, fast speech, slang, idioms, and body language. The speech is fast enough that the auto-subtitle feature in YouTube doesn’t work at all for these videos. But, since it’s YouTube, you can replay any part as often as you like. Which one is your favorite video in this large collection? Leave a comment with your recommendations. Categories: Suggested Websites | Tags: colloquial, everyday, fast speech, Idiom, informal, listening, Slang, video, vocabulary, YouTube | Permalink. TED Talks are a popular resource to learn about ideas that may transform our world. They also provide a platform for developing English fluency, vocabulary, pronunciation, listening, and more. Let’s look at fluency, for example. Try this. 1. Watch a cool TED talk (one of the 6-minute talks if you’re in a hurry) at http://www.ted.com or with the Apple or Android TED app. 2. Turn on the subtitles and watch a second time, and if you’re using the web browser version, click on any phrase to skip around the talk to parts that interest you the most. 3. Pause the video three times to ask a question. Yep. Just pretend the speaker can hear you. Ask out loud if you’re in a private space; imagine speaking your questions otherwise. For each question, speak (or imagine speaking) a possible answer. 4. Tell a friend about the parts of the TED Talk that interested you. If there isn’t someone nearby who’d like to hear about it in English, pretend there is! Even without a real audience, speaking to an imagined audience will boost your fluency. 5. 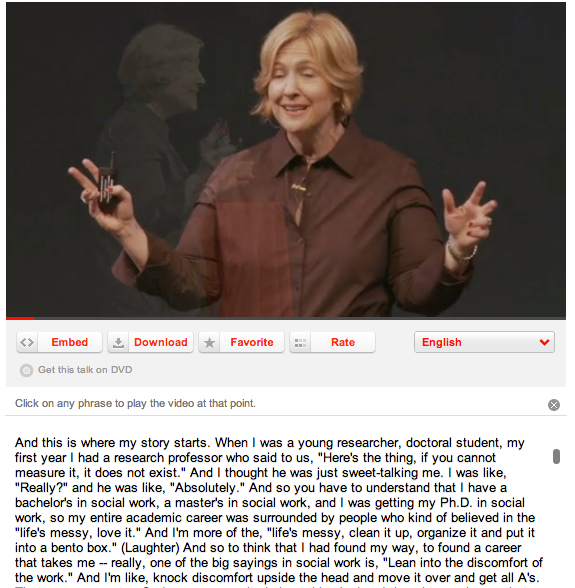 Add a comment here recommending TED Talks that others should check out. Thanks! Categories: Suggested Apps, Suggested Websites | Tags: English fluency, fluency, listening, TED, TED Talk, TED Talks, transcript, video, vocabulary | Permalink.